Behind the Neck Lat Pull downs: Performed behind the neck, this exercise places undue stress on the cervical spine, shoulder and rotator cuff, in addition, it does not effectively train the Lat (Latisimus Dorsi) muscles. Almost all behind the neck movements are a no-no when it comes to shoulder and neck safety. The problems occur once the bar slides behind the neck. This forces the neck into a forward position while rotating the head of the Humorous (main bone of the shoulder) forward impinging the muscles and tendons. 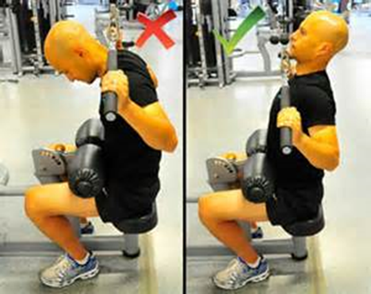 The Lat muscles can’t function properly making the exercise ineffective.